IPL 2019 will begin on 23 March with the defending champions Chennai Super Kings hosting the Royal Challengers Bangalore. Yesterday BCCI finally released the full schedule of the tournament, and as expected, the whole tournament will be played in India - with each team playing seven home and seven away matches. However, unlike other seasons, there will be no opening ceremony this year. In the aftermath of the Pulwama attacks, BCCI decided to donate the money that was to be spent on the opening ceremony, to the families of the martyred jawans instead. Since the opening match of a season is always huge, every player - especially the young Indian players - will look to stamp their mark on the proceedings right from the word go. However, two Indian players ended up on the wrong side of the history books in the past, by getting dismissed on the first ball of the first match of an IPL season. In 2010, the IPL returned to India after the previous season was moved to South Africa due to the general elections. The defending champions Deccan Chargers faced off against Kolkata Knight Riders in the season opener. Former Indian captain Sourav Ganguly returned to captaincy for KKR while Adam Gilchrist once again led the Deccan Chargers. Since Hyderabad was not selected as an IPL venue due to the formation of the Telangana state, DC played their home matches in Nagpur, Cuttack and Mumbai. As a result, the opening match of IPL 2010 was held at DY Patil Stadium in Mumbai. DC won the toss and elected to field first. Manoj Tiwary and Brad Hodge opened the batting for KKR while Chaminda Vaas began the bowling proceedings for DC. Vaas bowled the first delivery on the pads to Tiwary, who flicked it straight into the hands of Rohit Sharma at mid-wicket. It was a soft dismissal, and Tiwary had to depart for a golden duck. In the process, he became the first player to be dismissed on the first ball of the first match of an IPL season. After four years of unsuccessful attempts, KKR finally reached the IPL final and won their maiden trophy in the 2012 season. Led by Gautam Gambhir, KKR clashed against Mahela Jayawardene’s Delhi Daredevils (now Delhi Capitals) in the 2013 season opener. KKR’s home venue, the iconic Eden Gardens in Kolkata, hosted the opening match of IPL 2013. KKR won the toss and elected to field first. 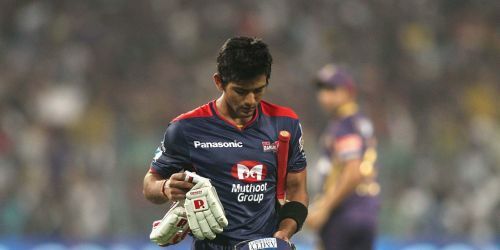 Unmukt Chand and David Warner opened the batting for Delhi while the veteran Australian speedster Brett Lee opened the bowling for KKR. Lee bowled a cracker of a first delivery as the ball pitched in the full length area around middle and off and swung away late to disturb the timber. Chand was foxed by the late away movement and missed the ball completely as it went on to hit the off stump. Chand, who entered IPL 2013 on the back of a victorious 2012 ICC Under-19 Cricket World Cup campaign, thus became the second player to be dismissed on the first ball of an IPL season. Since Chand, no other player has joined this infamous list. On 23 March 2019, we will find out whether any other player will join this list. IPL 2019: Match 10, DC vs KKR Match Prediction: Who will win today's match?